House, 8 Private Bdrms+Suite (7Queens,2Doubles,10Twins) 5 Baths, Sleeps 8-20 !! This sophisticated beach-house-style lodge in coveted Chatham will accommodate large family groups of all ages and grandparents; or discerning groups of couples or singles. Eight private bedrooms + suite. All beds are standard adult size suitable for adults or children. Ideally situated steps from beach and boating. Beautiful home, stroll to shops, restaurants, ice cream, bike path, & famous Hardings Beach on Nantucket Sound... top-rated beach, fun for all ages. and safe... and just minutes from vibrant downtown Chatham! Welcome to captivatingly beautiful Chatham & '"Harborview House", the main estate house of a former private sailing retreat in prestigious 'not-to-be-missed' Chatham, now a beautiful, quality, year-round vacation house. This spacious, charming, well-maintained, extra-large 19-room beach-house-style lodge is 'Family/Reunion Perfect'! The common areas are large (great room, dining room, family room, breakfast area, etc. ), there are two full kitchens, and the bedrooms are numerous: ALL beds are suitable for adults or children...no bunk beds, no trundles, no undersized beds, no cots. This property sleeps 8 to 20 very comfortably. Private 1st floor suite with 2+ bedrooms, 2nd kitchen area, full bath, for general use or for additional privacy for families with young children, or grandparents. Central A/C throughout! High-speed wireless internet. All modern baths. Oriental rugs, rustic charm, beamed ceilings, wide pine floors, massive fireplace, quality furnishings...a crisp immaculate modern-classic... nothing dowdy... nothing dated... safe for young children (fully enclosed 10x30 harbor view deck, private off-road grounds). The house is very gracious, spacious, private, & fully-equipped... perfect for that special family reunion, multiple families, singles, couples, getaways, wedding (family) lodging, golf-outings, celebrations, executive. It is located in a wonderful safe private area for children, walks, biking, boating, swimming, clamming, surfcasting, fishing, kayaking... or just plain relaxing! This charming yet sophisticated private beach house overlooks Oyster Harbor on Nantucket Sound, the south-facing side of the Atlantic Ocean. Child-safe beach pedestrian walkway, bike path, to magnificent Hardings Beach or to our quaint village hamlet with shops, restaurants, ice cream,etc.. It is a beautiful leisurely stroll to both! This path also connects to the Cape Cod National Seashore Rail Trail which covers the entire Cape! Since historic Chatham is ideally located at the 'elbow' of the Cape... midway between Falmouth and Provincetown... it is the perfect off-the-beaten-path 'hidden jewel' for endless exploration of 70 mile long Cape Cod! Harding's Beach on Nantucket Sound is 1-1/2 miles long and offers two spacious white sandy beaches with warm water swimming and terrific beach combing. National Geographic Traveler ranks Hardings as the safest and 'Top Cape Cod Beach For Families of All Ages'. It is ranked as one of the top 10 family beaches in the U.S.
Sun and relax on the deck and enjoy the picturesque harbor boating scene or stroll the many peaceful and scenic backroads of Chatham. Deeded association path to water... Kayak from Oyster Harbor to town or isolated Nantucket Sound beaches... Moor your boat a stone's throw away... or rent... at one of two neighborhood marinas. Bring your bikes... or rent... safe biking to the beach or bike the Cape... this is bike path country! Fall in love with the view, the beach, the area, the ambiance. Set down by the water and nestled in the towering pines, this 3-story property at first appears diminutive...it is anything but! With ocean harbor views, numerous private bedrooms, and many large common areas, this property is the largest vacation rental in the Hardings Beach area...and one of a select few that offers the best of all worlds...quality, location, togetherness AND privacy. The beach is a key reason many, if not most, people come to the Cape. Hardings Beach has received national recognition due to: its expansive size (over a mile in length for those long beachwalks); its beautiful dunes; its white sandy beach; its breath-taking walk to Stage Harbor lighthouse (incomparable! ); its South-facing orientation for the best and longest sunny days; its location on the warmer and calmer waters of the south-face of the Atlantic Ocean, known as Nantucket Sound, the best of Cape Cod; its lifeguards; its safety for children; its ample parking (no parking problems! ); its REAL bathhouses; its relatively uncrowded summers (everything is busy on the Cape but Chatham, a quaint fishing village & resort, is off the beaten path); its swimming, recreational surfing, fishing or surfcasting, kayaking, windsurfing, kite-boarding, paddle-boarding, all possible regardless of the tides, with great non-threatening waves for all ages; most importantly, no dangerous riptides and no unexpected beach closures; and, of course, its wonderful location in Chatham itself, 'Cape Cod's Most Beautiful Walking Village', the 'Nantucket of Cape Cod', known for its vibrant Town Center with unique shops, restaurants, galleries, festivals, and famous band concerts!! Not as rocky & shallow as the Bay, not as cold & rough as the Atlantic... Hardings Beach on Nantucket Sound is 'just right'. PLEASE NOTE: " Harbor House " is located 8-20 minute drive from ALL Wedding Venues in Chatham, Harwich, Brewster & Orleans, including Chatham Bars Inn (3.5 miles), Wequassett Resort (5 miles), Wychmere Harbor Beach Club (5 miles), Chatham Wayside Inn (2.5 miles), Ocean Edge Resort (10 miles), Captain Linnell House (10 miles), Old Sea Pines Inn (10 miles). We welcome Multi-generational Wedding Family Lodging and Wedding/Reunion combo (licensed child care available!). Wedding events held off premises. Member Chatham Chamber of Commerce since 2002! Keywords: Year-round, Top-Quality Rental, Sophisticated Beachhouse Style, Harbor House, Sailing Lodge, Large Family Rental, Wedding (Family) Lodging, Family Reunion, Friends Reunion, Retreats, Celebrations, Executive, Special Occasion House, Corporate, Ocean Harbor View, National Geographic Best Beach for Families of All Ages, Ocean & Bay Kayaking. Many spices, flour, sugar, artificial sweeteners. Dish and flatware service for 24, purchased 2017. Four kayaks and deeded water access. (2) 2 decks. 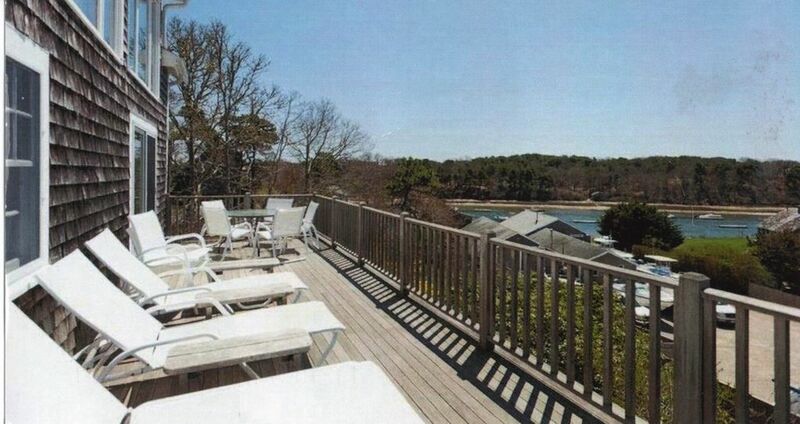 One deck is large and overlooks the harbor! This house is unique and allows for VERY VERSATILE sleeping arrangements (Q, D, T, sofabed, 2 pack n plays) for a large variety of groups. It is designed to accommodate up to 20 in comfort (average group size is 14)... singles, couples, or families. Eight private bedrooms + suite, all 19 beds standard adult-size. Togetherness and privacy for large groups, family groups of all ages, and grandparents! Please contact us if you would like to discuss details specific to your group. This was a terrific house for a large group. The two kitchens came in very handy as well. We enjoyed our stay here. It's convenient to the downtown area as well as the beach. It also overlooked a quiet harbor. We are so pleased to hear that you enjoyed your stay! We love that we offer a great setting for friends/families to connect and relax. Thank you very much for taking the time to share your experience! I shared this house with my family and friends the weekend of my wedding. It is beautiful and spacious and we all had a blast. Betsey was extremely accommodating and so easy to work with!! I am from the Cape as is she, so we both cherish being able to share the experience of Cape living with others. They take great pride in this home. If I ever have another get together I wouldn't hesitate to rent. Thank you so much!! We had a great week at 14 Squanto! It was perfect for our group of various ages. The house is in a great spot and it is so clean and spacious. We loved sitting out on the deck. Betsey was amazing and helped us with all our questions. We loved the seal tour she recommended. We hope to be able to stay there again next year! equipped kitchens and plenty of eating space, we shared some memorable meals together. Conveniently located to downtown Chatham for restaurants and shopping! We're so glad you enjoyed your stay! Thank you for sharing your experience. We had a large group with lots of kids, and they were never wanting for things to do. We have stayed at this property for a couple years now, and love it. We searched over many years for properties large enough to accommodate our large group (15-20 spanning young children to greying). Plenty of parking, bedrooms, and baths for large groups (multiple families), with roomy shared spaces for eating and relaxing together. This past stay, there was some rain, but even stuck in a house all day was relaxing and not claustrophobic as in some rentals. The beaches nearby are great (a little more protected in terms of waves), and plenty of good eats if needing to eat out on occasions. Kitchen is well stocked for sit-down meals. Also, the owners are wonderful and helped us accommodate some circumstances; they really care about the property and it shows. *Top-quality rental* Sleeps 8-20 in comfort (adult-size beds for all: couples, singles, children! 7Q,2D,10T). No bunk beds, no trundles, no undersized beds, no sofabeds, no cots. 2-7 night minimum stay. Year-round. Effective 7-1-2019, there is a 12.45% tax in the state of Massachusetts for vacation rentals. This tax will be payable by renters to landlord, and is in addition to the quote provided by VRBO. QUESTIONS? CONTACT OWNER Thank you!